Hi Rob, interesting piece. Well outside the date range that i have experience of. However when i first used OSL I was lucky enough to be able to check the results against C14 dates, and found a very strong correlation. I like the method myself, but as you say, there's no reason not to check the dates you are on about, and it would also be interesting to see what method produced the tightest error ranges and highest degree of confidence. As i say interesting... watch this space? Thanks, Stuart. Were your OSL dates from an open-air site? I think that may be the difference, if there is one, between close correlations like you experienced and those that might be found in caves and rockshelters (about which I've bored you and everyone else before now). Definitely, watch this space! There are two main issues in play with dating bone of that age, collagen preservation and the measurement itself. I'll start with the latter. Calibration against a curve isn't the issue. What counts as 'infinite age' depends on the AMS instrument doing the measurement and to what extent they can reduce it's background activity to zero. In 2002, it's likely that most labs would have been running backgrounds maybe as high as 40-45ka BP. (Backgrounds or blanks are standards known to be infinitely old, usually of the same material as the unknowns you're running, and pretreated the same way; for wood or charcoal it might be Queets Wood or USGS coal, for bone it might be a Pleistocene mammal, for carbonates a geologic calcite, etc). Then outside of the how the machine is tuned, the material and the pre-treatment dictate how clean of contaminants the blanks get. That background 14C is subtracted from the unknowns, but it also affects the precision of the measurement. What gets tricky then is when you have poor backgrounds. It becomes difficult to distinguish a radiocarbon activity of say 45ka BP from the background. So it might be of infinite age, even though you can go and calibrate 45000+/-750 BP on Fairbank's curve. Nowadays there are AMS devices at a few labs that routinely run at backgrounds lower than 50ka ... though getting that on bone is more difficult than wood, which in turn is more difficult than calcite. Bone blanks I've processed in the last couple of years seem to run between 46 and 51ka, averaging around 48ka. 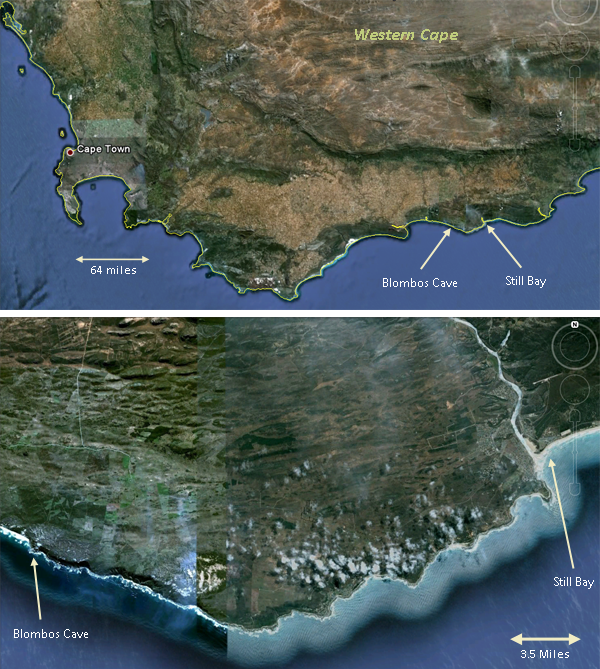 So maybe, yes, the bone artifacts from Blombos could be dated with newer devices, say at UC Irvine, ETH Zurich, or Oxford. Possibly Belfast, I forget what they're running. But there has to be collagen in the bones in the first place. I don't know what the organic preservation is like there, but assuming it's a limestone-ish cave, that tends to be pretty poor for collagen preservation (pH too high). They look well preserved in the photo, but bones that are well preserved for the zooarchaeologist are often not well preserved for dating. If we assume we could get 1 gram of bone, and it's only 0.1% collagen after doing ultrafiltration or similar (which is low) you're running a sample that's 1mg. Combusted and assuming 40% C for collagen, you're down to 0.4 mg C. That's not super small, but it could start to eat in to the precision, since that's size dependent. If you had worse preservation, or a smaller sample to start with, you will definitely have lower precision. And that brings you back to the background. When the precision is poor, even a clean blank may not allow distinguishing infinite age from an actual 47ka age. And with a small unknown you need a comparably small blank and the background are usually higher, maybe 43-45ka ... and misery ensues. But none of that is to say it couldn't or shouldn't be tried, because it's obviously an important question, and having multiple lines of dating is key. 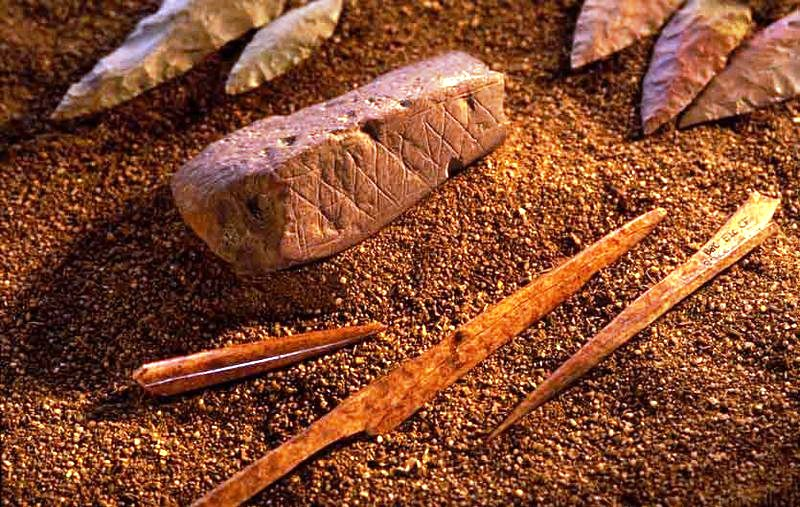 The advantage of dating the bone tools instead of the sediments is that they are evidence of hominin behavior (assuming they are tools ... but that critique is your department, pal). At any rate, dating bone is hard, and older bone is harder yet. Can I bring your extremely helpful background on background into the foreground and put it up as a guest post? I think it's really important to have such clarity in these matters, and I'm not certain everybody in the 'community' is aware of the niceties (should I have been?). On another note, as far as I'm aware there's plenty of charcoal. I suppose it's possible that similar chemical drawbacks ensue, but maybe not? I shall leave this one to the experts I think! Thanks for clarifying. As you can probably guess, I don't dispute the physics of OSL, any more than I do that of 14C. It's always been the case that the error comes in the application. 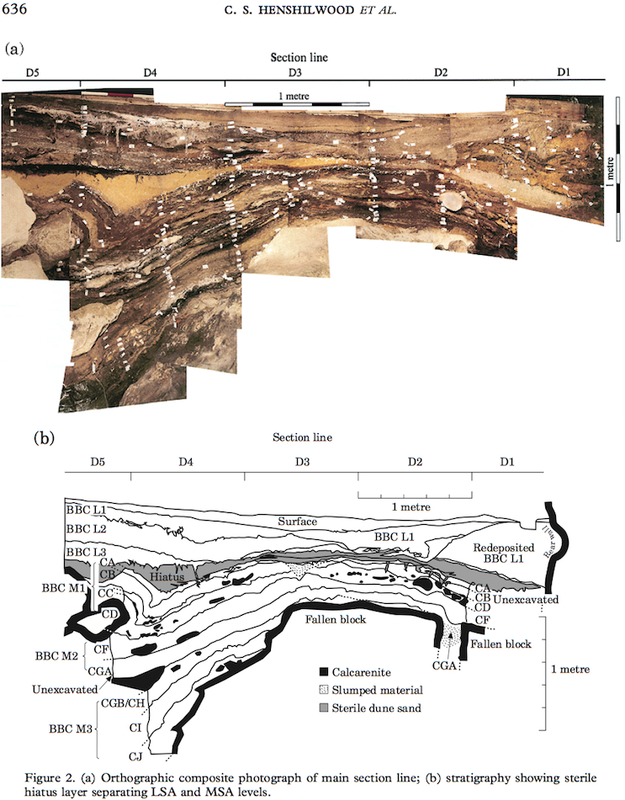 Have they done any detailed analysis of the stratigraphy beyond drawing the section? A Harris matrix for example. It might help clarify the deposition sequence and which layer is to be dated.